The elephant situation at the San Antonio Zoo is getting serious. 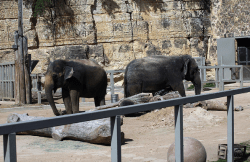 According to a local news item, In Defense of Animals has filed a complaint in California against the San Antonio Zoo, saying aggressive behavior between two elephants, Lucky and Boo, will probably result in “dire consequences.” IDA is calling on the U.S. Department of Agriculture to act immediately and remove the elephants from the zoo and transfer them to a natural-habitat sanctuary where they would have room to move and could choose their companions. In the meantime, IDA is asking the USDA to require constant monitoring of the elephants by the zoo. Lucky and Boo have had hard, sad lives. Lucky lived alone for many years in small, cramped surroundings. Boo — formerly named Queenie — suffered abuse for decades as a circus elephant. When Boo was rescued from the circus, animal organizations like ElephantVoices and IDA lobbied for both Boo and Lucky to be sent to a sanctuary to live out the rest of their years in peace. That didn’t happen, and now Lucky and Boo live in close quarters, with increasing signs of dangerous aggression. Who knows how long it will take to USDA to act, if it acts at all. Don’t wait. Sign the Change.org petition to free Lucky and Boo (a.k.a. Queenie) from the San Antonio Zoo and place them in an appropriate wildlife sanctuary. The longer these two elephants are forced to live in such a bad environment, the greater the chances of one or both of their lives ending in tragedy.